I am blown away by what is happening with this crusade to help people with their money. Simply blown away. When I fired myself from my j.o.b. in September 2006, it was for one thing – to help others realize how easy it is to win with money and to teach the practical tools that Jenn and I used (and still use) to achieve financial freedom. It is still all about that one thing. I love seeing people become financially free. I love seeing family relationships restored because the money issue is resolved. I love seeing marriages being restored. Watching hope rising up within the hopeless. It is all about getting the finances straightened out so that people are able to do EXACTLY what they have been put on earth to do. I am seeing this entire crusade explode before my eyes! I am humbled and honored that so many people are carrying this stuff to their friends, family, and coworkers. I Was Broke. Now I'm Not. would be written, published, and sell thousands of copies? 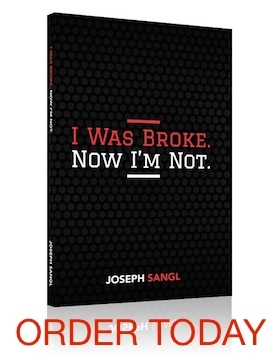 An accompanying Group Study for I Was Broke. Now I'm Not. would be written, published, and sell over 1,500 copies in less than two months? Two teaching experiences would be born out of I Was Broke. Now I'm Not. The two-hour Financial Learning Experience and the Financial Freedom Experience? Over 1,000 people at NewSpring Church would receive one-on-one financial counseling for FREE? Over 3,000 people at NewSpring Church have participated in the Financial Learning Experience or Financial Freedom Experience? I would be able to speak to or teach over 25,000 people and the speaking/teaching schedule would be booked out over five months? I have said it countless times, but I am going to say it again. I can not believe I get to do this for a living! It is all about a vision and passion that God Himself poured in to me. Since the day it happened, I have sought to pour myself out into doing EXACTLY what I have been put on this earth to do. To all of you who have invested in this work, THANK YOU. To help others accomplish far more than they ever thought possible with their personal finances so that they can go do EXACTLY what they have been put on this earth to do.